When kids can type email addresses faster than they can write their own names, and their thoughts flow most naturally in the form of tweets and status updates, writing takes on new shapes and meanings. Opinions, desires, fears, and frustrations are relayed in typed text often before they’re even spoken aloud, and then posted for public consumption. So it’s no surprise that young people today have taken to blogs to find their true voices, and then share them with the world. I found this little nugget after seeing George Couros’ tweet advertising it. The quotations found herein are from this article. It really came at an apropos moment as well as the videos featuring the HWDSB Commons had just been released by the Literacy Numeracy Secretariat and both Jared (HERE) and I (HERE) had written reflective pieces on blogging and the construction of the HWDSB Commons blogging platform. We believe in the power of blogs and have devoted a large portion of our breathing days to create and support such environments. “Why Students Should Blog” mirrors some of the ideas and rationale I pose HERE for why I began to use blogging in my teaching / learning environments and what I saw in terms of student engagement and achievement through their use. …more informal than structured essays, blogging can encourage young people to trust that their written words have power and that expressing themselves through written storytelling can transform themselves and our communities. I couldn’t agree more with the above statement. Blogging is built on the concept of journal or diary writing. It is a place where ideas and opinions can be expressed, substantiated, reflected upon and shared. It is a place where one days challenges can be another day’s success and, by means of a simple URL, the two can be linked together. Further, nobody learns in isolation. We are social beings. We learn daily whether we like to admit it or not. In real life conversation, a person will often reference where they learned or heard something: television, music, friends, family, teacher, etc. In formal work, I have found that students tend to forget the required referencing of borrowed or referenced material. Formal citation is difficult to remember. On a blog, all referenced and borrowed material can be easily linked together, thus giving the student more time to reflect on the “meat” of their expression rather than the structure of it. In fact, I never graded a students blogging experience until the end – after they had time to learn from their previous posts and those of others – not until they had been given numerous opportunities to reflect and grow from their learning experiences. I think the reason I love it so much is there are no rules—unlike an essay, no one is marking it, and you’re given essentially free rein. A blog, therefore, is a digital portfolio, a collection of learning that is ongoing, fluid, and ever changing. Blogs are the perfect Assessment FOR Learning tool. In terms of Assessment AS Learning students can reflect upon their learning (self-assessment) and support that of their peers in the same (peer assessment). Student work has a real audience and, as such, students see the value in it. Blogging as a writing form opens the door for 21st-century creativity. The format begs for multimedia inclusion and interactivity. Instead of describing an image, link to a photograph. Instead of quoting from a news report, embed the YouTube link. Instead of reading a blog and fuming or cheering from the solitude of your desk, add a comment. Blogs are also personal. Students can express themselves and their personalities with other like-minded peers. The extension of communication and expression into the digital realm provides greater opportunities to “meet” people they have things in common with. Teenagers can relate to the crises and dilemmas they read about on others’ blogs, realize they’re not alone, and find camaraderie in shared experiences—including experiences of injustice. At the recent Director’s Student Voice Forum, students spoke to us clearly about their need for safe and caring schools, caring adults, engaging and interactive learning environments, and extra-curricular experiences outside of those for learning. At our Student Voice Forums, we asked our students to tell us what makes a high school great . Our students spoke very clearly that they believed that a great high school has the following characteristics: a) Caring adults who believe in them; b) Good friends who support them; and c) Engaging programs that interest them. When I inquired, these students continued to speak about the importance of positive school climate and school spirit. This information provides us with important insights. We definitely want to challenge our students to achieve. We support our students so that they are resilient and healthy, both physically and emotionally. And we are committed to create learning environments that meet our students’ interests, strengths and needs, which means that our schools need to offer a wide variety of courses leading to all pathways. The students also showed us that they prefer a blend of personal, face-to-face and digital interactions. Prior to the Student Voice Forum we asked students how they prefer to express themselves. 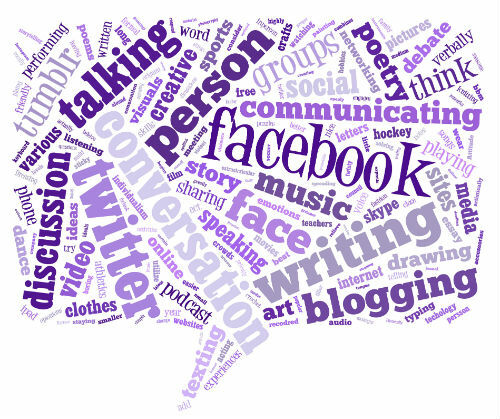 In the tag cloud below you can see that talking, discussing, and conversation are important but so is Facebook, Twitter,and (at the bottom right-hand corner) blogging. In fact, all are extensions of the same thing – communicating – experienced in a variety of ways. The virtual connections, however, are further reaching, accessible by a far greater audience and capable of effecting change on a variety of levels. The key to using blogs in a classroom / learning environment is to allow students freedom to explore without worry of penalization in terms of structure, spelling, or grammar. I, too, made my class blog public and encouraged students to do the same. This is where the authentic audience comes from. If blogs are private then they are no different than the locked diary accessible only to one person. If shared only with the teacher then the opportunities for shared reflection are lost and the authentic audience non-existent. As such, let students explore with freedom. If you wish to grade writing structure, spelling, and grammar, then give them the semester/term to explore, revise, share, adapt, revise, post, re-post, cross-post, etc. until they are happy to present a final polished work. This could be a revised series of posts presented at the end of the project. All previous posts serve only as assessment tools and the final posts presented for evaluation. In my experience, if you focus on spelling and grammar and expect students to do the same they spend more attention on structure and less on content. The fluidity of expression is, therefore, lost. Tyanna’s statement above is also telling: “It’s hard to see past an adult’s red pen.” Students sometimes forget that our comments on their work are to offer support for growth and continued learning. They see our markup (especially in red pen) as evaluative – an expression that they did something wrong. On a blog, replies to posts are more reflective in nature, seen as more supportive, and are seen as part of a conversation – not the end of it. I will add some more to this conversation in the coming days. Until then, be sure to read the entire article, “Why Students Should Blog” at http://amplify.com/article/why-students-should-blog. Blogging is a great way for students to allow their ideas to free flow. I do agree that making it public and receiving comments on a blog is more reflective and less critical. In addition, it is one of the many writing exercises that can be explored in a class. Formal writing is important as well. Technology can support a more formal writing process as discussed in the previous blog. Truth be told when students enter the work force they are asked to write in a variety of ways. Exploring multiple writing and communication forums is great. School leaders need to provide teachers with training so they plan engaging lesson utilizing various communication forums.